The temperature rose to a whopping 35-37° this week! As Alaskan kids will do when the Winter cold starts to loosen its tight grip, storytime regulars showed up in sun hats, t-shirts, and even capri pants. Everyone was in the mood to be hot so it was time to explore the jungle! 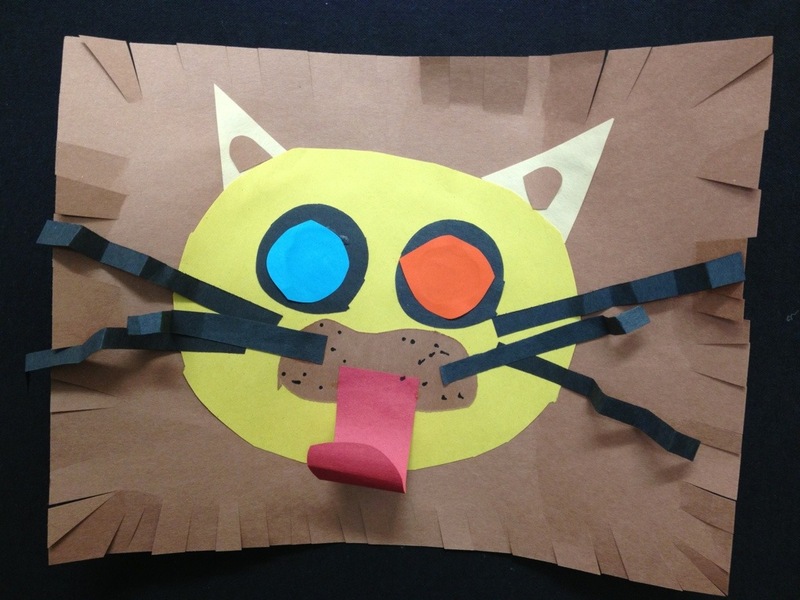 Thanks to the internet and lots of creative librarians out there in cyberspace, I came up with a fun program that I did at the library and on the road. The program, especially the book choice, was most appreciated by the preschool crowd, but the songs and activities equally appealed to most of the younger ones. Alaska is a long way from any jungle, aka tropical rainforest, although we do have areas of temperate rainforest in the South East part of the state. To get ourselves in the mood for the fun stories ahead we took a trip with the globe and figured out where we might find a jungle, how we could get there, and then what we might find there. We found Alaska, the Equator, and several continents including Africa and South America. Jungle Animals, part of the series Picturepedia, gives a great overview of the variety of animals that inhabit the canopy, understory, and rivers of the hot and wet tropical rainforest. We spent some time trying to imagine what it might look and feel like in the jungle. 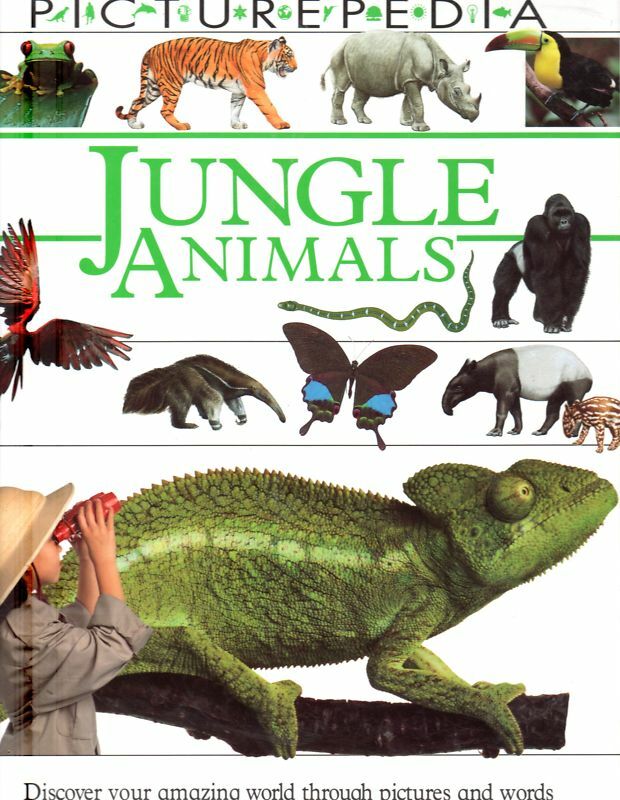 For many families, non-fiction books do not seem very approachable for preschoolers, but using books like the Jungle Animals in storytime is great for modeling how to read non-fiction with young children. Since we were very excited by all of the amazing creatures, we then sang this fun song. As we sang, I placed an animal card on the felt board. I pointed to the text printed at the bottom of the card as we sang the name to support print awareness. 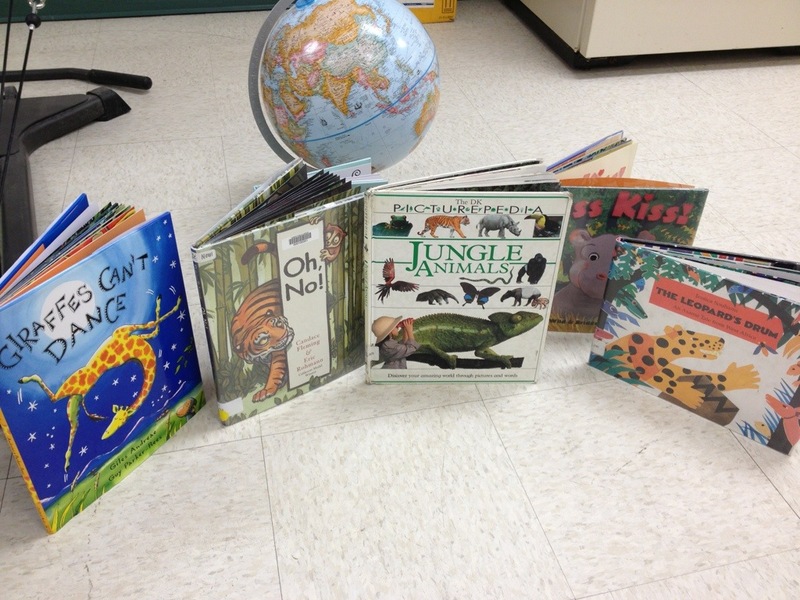 The lions roared loudly, the monkeys were silly, and frogs were hopping all over the room! I found a plethora of jungle related songs and fingerplays so I followed up with this fun little ditty using my five little monkey finger puppets. They’re wearing jammies, but they worked well enough! We followed up our singing with the book Oh, No! 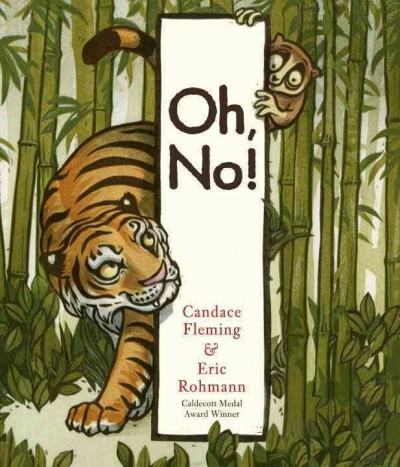 by author Candace Fleming and illustrator Eric Rohmann. This book, with its repetitive text and progressive story, is perfect for the preschool age. It’s the tale of five jungle animals that each fall into a huge hole in the bamboo forest while trying to help out the animals who have already tumbled in. When the waiting tiger appears at the top of the hole (a scene masterfully created on the page with a from-bottom-of-the-hole perspective), the animals yell “Oh! No!” for fear they will be the next meal. Don’t worry. The mighty elephant saves the day, but more than once a child declared, “Look out! There’s the tiger!” at the tiger tail or paw that is camouflaged on most pages. My favorite page? The last. Not the one with a view of the large elephant behind with the five rescued animals being carried off to safety, but the very last with the one of the hole’s edge with tiger paws emerging. Did the tiger climb out or did he stay stuck in the hole? It’s a nice use of the endpaper. After Oh! No! it was time to get moving! Clapping and slapping the tops of our thighs worked well for most kids, but the younger ones just clapped their hands to this infectious chant. Think of an animal that you’d like to meet. That you’d like to meet ________! A _____ A ______ She / He wants to see a ________! Then have all of the children imitate that animal. The last book of storytime was either Giraffes Can’t Dance by author Giles Andreae and illustrator Guy Parker-Reyes or Kiss Kiss! by Margaret Wilde and Bridget Strevens-Marzo. While the opening scene of the savannah in Giraffes Can’t Dance led many kids to claim “That’s not the jungle!” and the book may seem unrelated to the theme at first, the story quickly evolves bringing the action to the jungle. It’s a cute story with rhyming text. The images are bright and full of detail which makes it good for sharing. 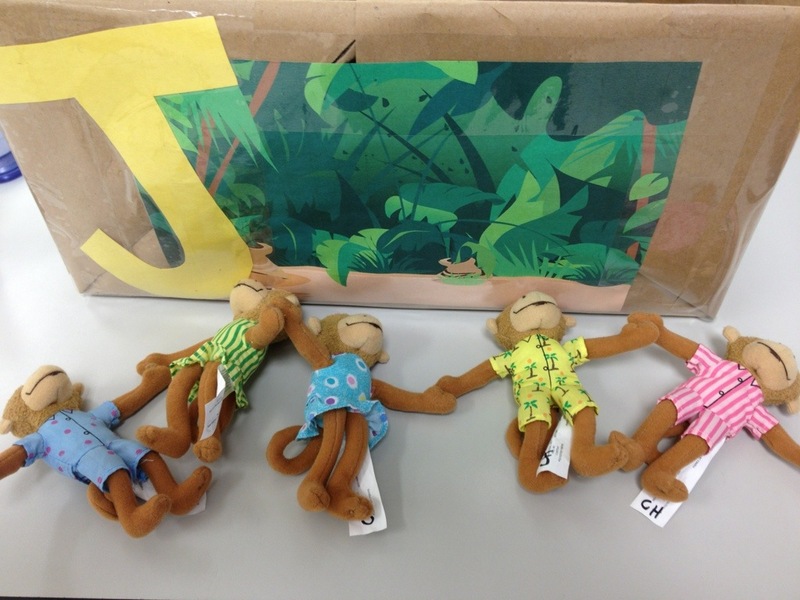 Right before craft time, I introduced the group to the jungle box I found on Abby the Librarian’s site. We practiced the “J” sound while I passed out animal cards to each child. I sang Abby’s song using the names of animals found on the cards and the child(ren) with the appropriate animal card came up and put the card in the box. 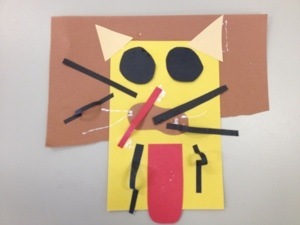 The activity made for a nice transitional activity that got kids up and ready to move to the tables to create their lion. 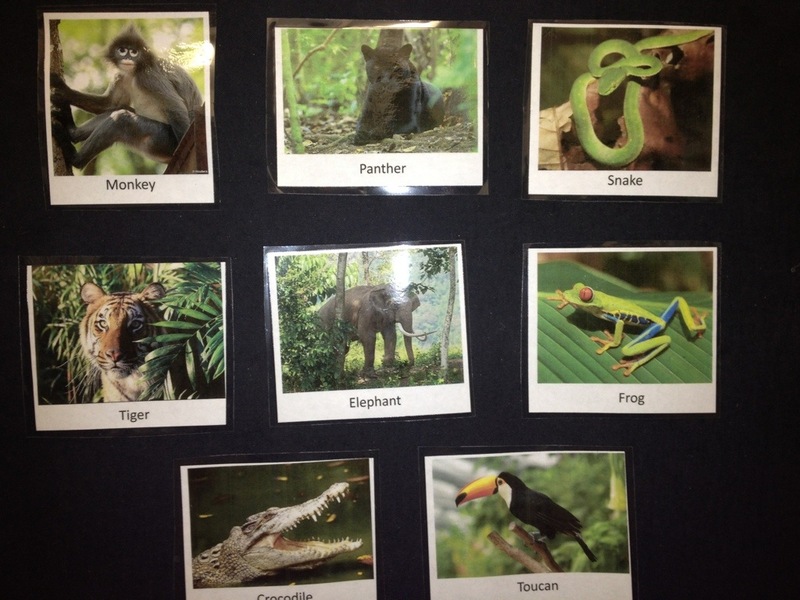 Many kids told each other and me which animal was their favorite and made up sounds for each. I used the same animals as I used on the felt board so they were familiar. The toucan sounds were especially creative! Families got creative and few lions matched my rough sample!